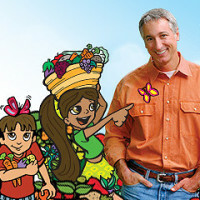 Here’s an excerpt from SuperKids Nutrition’s interview with Joe L’Amp, the Joe behind “joe gardener”®, that shows you simple steps to take to introduce kids to gardening. Start with seedlings – you can use a kit, yogurt cup or any small pot. Just be sure that whatever you use has a hole for drainage. Seed and plants can rot if the soil stays too wet. Bring them indoors and keep them by a window. Once the seedlings are growing strong –transplant to a pot or your garden plot. Check out Joe’s garden blog to guide you through the steps to grow a family garden. Read the full interview with joe gardener® and get started on a family garden today! I live in the Boston area, and my roommate wanted to start growing an herb garden in October. Normally, you would think this feat would be impossible, but she found a way! We planted herbs in small pots and put them inside a cart, which we wrapped with plastic wrap to help lock in some heat. We also put a heating lamp and powerful lamp for light directly over the plants in the cart to mimic the sun and the heat. Now it’s April, and we have a bunch of herbs, great for cooking tasty and healthy food! So, if you feel limited with your garden capabilities because of the season or weather, remember this story to help you figure out how to make the plants grow!